The former Woodman pub is a fine Victorian building – with some lovely detail to be observed if you look skywards. 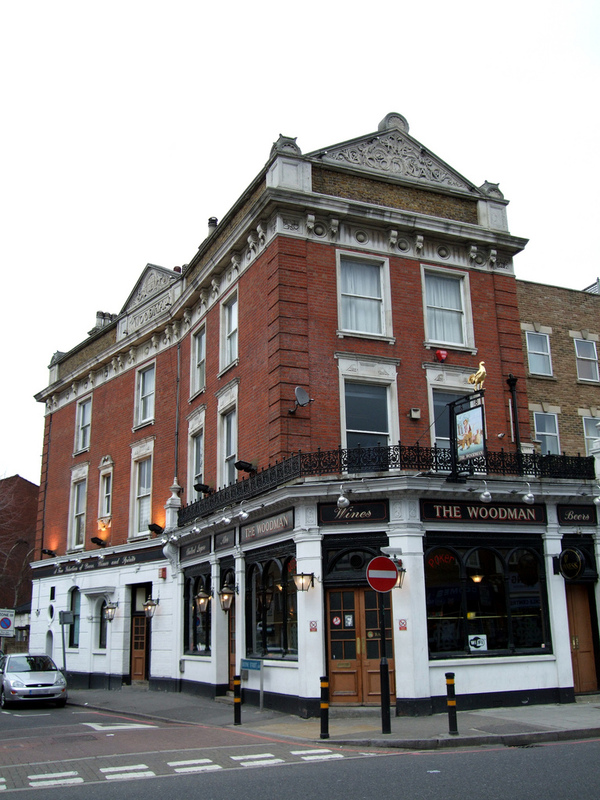 The Woodman, in its first incarnation, was one of the earlier pubs in Lee – the original was the (Old) Tiger’s Head at Lee Green, but the local justices approved the licence in 1838, along with the nearby Swan of Lee (now Rambles Bar). It was one of four public houses (clockwise from the top left below – the Swan, the Greyhound, the Woodman and the Royal Oak) around what was originally referred to as Lee New Town, all but the former Swan have closed, and from the outside at least, that too seems to have a precarious existence. The first landlord of the Woodman appears to have been Alexander William James Durham who came from a family of publicans – he is listed there in the 1841 census on what was then referred to as New Road – what was to become Lee High Road used to followed a course which was largely that of Old Road and was straightened after the demolition of Lee Place and the breakup of the Boone estate in the 1820s. His father, Jacob, seems to have owned the pub (it was part of his estate when he died in 1866) and lived close by in Boone Street, where he was listed in the 1841 census. Alexander moved on during the 1840s and was living in Lambeth when he died in 1848. As is common with many pubs there was a steady ‘trickle’ of licensees at the Woodman throughout the mid-19th century, none seemingly staying more than a few years – for example, Ann Gordon, a widow from Ockley in Staffordshire, was there in 1881 but had moved on by 1884 (1). By 1886 the licensee was a J W Coombe (Comb) who was landlord when the pub was demolished and rebuilt (2) – the current building it is dated 1887 (shown in a postcard via eBay November 2016). Coombe didn’t stay long in the new pub, by the time the 1891 census enumerators called, the publican was George Ridley, who hailed from Newbold in Warwickshire, and his wife Eliza, from Bunwell in Norfolk, were probably the first licensees of the rebuilt pub – they were there until around 1902 when George died, Eliza may have remained slightly longer but there was a new publican in 1905 – Thomas Craddock, who came from Southwark. There were two bars, what was sometimes referred to as the snug at the front, and larger room at the back, with a separate off licence next door. All were interconnected so that whoever was serving could look after them all. Around the Second World War Albert and Florence Cordwell ran the pub – Albert had been born in Lambeth and lived in the area until his death in Bromley in 1979. During the war they put up photos on the wall of the locals that had fallen in battle. In the years after the war there were ‘beanos’ – trips to the seaside and elsewhere – such as this one (probably from the late 1950s courtesy of Marianne Cole on Facebook). Unlike other local pubs, they seem to have been just for the men – with crates of beer loaded onto the coach for the journey. 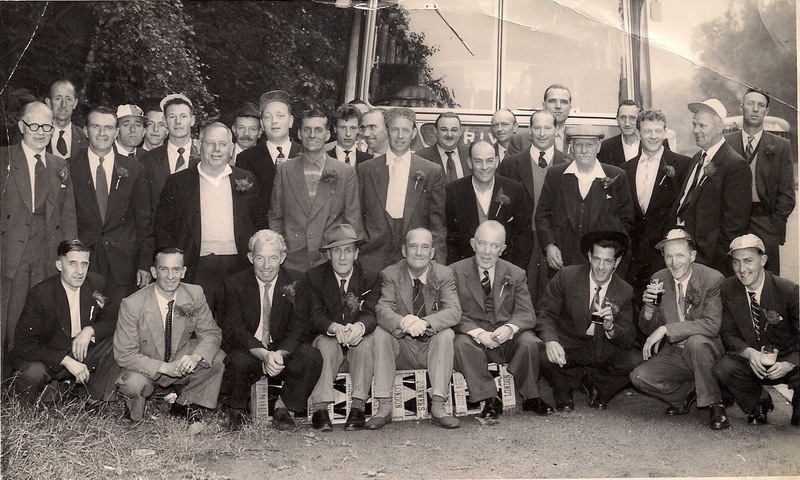 The button holes were almost certainly provided by Bill, a florist (third from the right on the middle row). From around that time there were happy memories of Wally playing the piano in the back room (from one of the Facebook threads on this post). Post war it went through a series of pub chains with various companies owning it, including Enterprise Inns, CC Taverns, Unique, Inntrepreneur and Courage. There was a degree of continuity with the licensee though – with Brian running it from the late 1970s or early 1980s until the early 2000s, his tenure was fondly remembered on the Facebook threads that came out of this post. 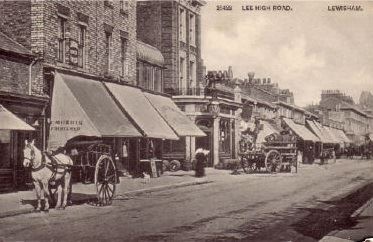 By this stage it had a reputation as a good local; it was latterly described as a “fairly basic, but friendly, locals’ pub on Lee High Road with an Irish landlord … decent enough for a pint or so if you’re nearby, or tackling the legendary Lee High Road crawl of an afternoon.” The photo in its latter years is on a creative commons via Ewan Munro. Under Brian’s tenure, the pub certainly had a lot of live music – some just singalongs to popular 1930s and 1940s songs around the piano on the small stage in the back room Friday or Saturday night. Jules Holland was spotted strumming with a couple of friends in the snug an at least one occasion. Dermot was the landlord in the early 2000s, he continued the musical traditions of his predecessor, his ‘party piece’ was Ewan McColl’s Dirty Old Town, with students from Trinity (now Trinity Laban) School of Music performing jazz there on Monday nights. There were certainly traditional Irish music nights on Sundays. The 11 remaining years of the lease was advertised as being for sale around 2008 for £75,000 with an annual rent of £37,500 but a turnover of just £234,000, although the estate agent’s details described it as ‘busy’. It was described as ‘Ideal for husband and wife team with assistance from 1 Full Time Staff.’ There was clearly interest as a new landlord attempted to rescue the pub bringing back traditional Irish music nights and some real ale. Given the state of the business before the lease was bought, it was always going to be a tough ask keeping the pub afloat, and so it transpired – something possibly not helped by poor ‘reviews’ latterly. The last pint of John Smiths (there proved not to be enough trade to support the London Pride served initially by the new landlord) seems to have been pulled sometime in late 2012 or early 2013. It was completely stripped of its fittings and was offered out on a much lower rent of £25,000, which was presumably taken on by its new tenant – a plumbing supplies firm – while the Courage cockerel remains the sign above has gone (source). Unlike many other closed local pubs, there haven’t been pages of memories posted on Facebook – maybe there hasn’t been a trigger to do it… So, if you worked there or drank there, tell your story, who were the characters who propped up the bar, the landlord, the staff, the atmosphere, the memorable nights, the particular celebrations that were held there, memories of the friends, the beers. Post them below (you can use your Facebook or Twitter login – or via Facebook (if you found the post via here) – if it is you first comment ‘here’, you will have to wait for ti to be ‘moderated’. I will update the post with comments. Anything libellous will get deleted here & no doubt on the Facebook Group pages. 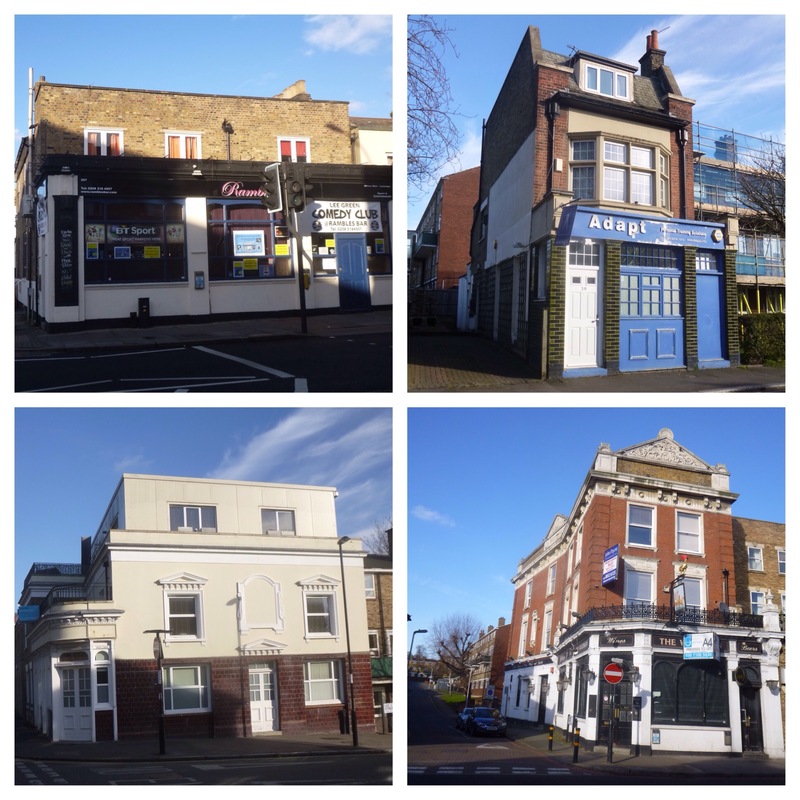 This entry was posted in Lewisham History and tagged Closed pubs, Lee, Lee High Road, The Woodman on February 16, 2017 by Paul B. The Woodman was certainly a great pub. I lived in Lee from 1985-2013. When I first knew the Woodman, it was run by Brian (last name?) who was Irish and reputedly had Guinness from Dublin, at a time when Guinness in London pubs came from Park Royal. The bitter wasn’t up to much, Courage, like every pub in south east London! There were two bars, front and back and a separate off licence next door but connected to the pub at the bar so that whoever was serving could look after both. There were brilliant singalong nights, when I first knew the pub in the 1980s. I thought they were on a Friday although I might be wrong. I don’t recall that they were particularly music hall, more popular songs from the 1930s and 1940s. I remember numbers such as “I’ve got my sergeant working for me now” (?) and there was a woman with a fantastic voice who always did “Lili Marlene”. The backing music was provided by two brothers, whose names I don’t remember, on piano and guitar on a little stage in the back bar. The pianist used to do fantastic intros so that the singers knew exactly when to come in. One of the brothers died and I seem to remember that the other did not want to carry on and that particular music rather wound down. People used to come from far and wide for those nights as well as locals from the estate up the road. My morris team, Dacre Morris, has been doing Beating the Bounds of the area as the start to our dance season every year since about 1983 and the Woodman was very often a stopping off point. Our tour is rather reduced in pubs now as we used to dance at the Royal Oak, another lovely pub, and occasionally at the Swan. These days we do the Dacre, our HQ, the Old Tiger’s Head and the Duke of Edinburgh. This year, the tour is on 22nd April. There was also an Irish session on Sunday nights, as you say, which I used to play at occasionally. This was when the pub was run by Dermot who I think took over from Brian. Dermot used to sing “Dirty old town”, which always tickled me as it is not an Irish song (it was written by Ewan MacColl) but because the Pogues did it, everyone thinks it is! It was still a very good pub in Dermot’s era, with locals from the surrounding area. I remember the jazz there, I used to come for that on a Monday night after morris practice, but I seem to recall that it was Trinity students who played on that night as, at the time, some lived in the halls of residence at Pentland House. Perhaps musicians from the Conservatoire played on another night? After Dermot left – I think he went back to Ireland – the pub went into a sad decline, run by people who didn’t seem to care. That’s brilliant, thank you – I will add a lot of that into the main post over the weekend. I first used The Woodman in 1953 I had just come home from Korea after 3 years ,on HMS Belfast there were a few local lads one of them came home earlier who used the pub, so arranged we meet up on our arrival . We was granted 62 days leave , so it see us very very often. Chap played the Joanna, think the land lady was Lena who went to the Garden Gate Downham in about 1960. 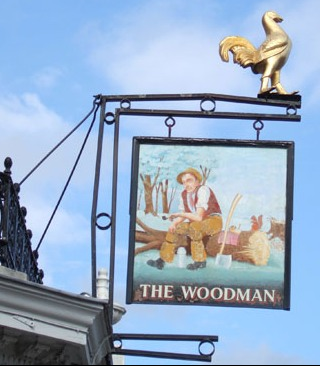 The Woodman looks like a warm place for a pint, the kind corner bar I like where you can strike up a conversation with whoever happens to be on the stool next to you. Yes, it was quite like that – a good ‘local boozer’ as it is referred to around here, sadly like a lot of pubs it struggled to cope with changing drinking patterns, particularly the ability to buy cheap beer in supermarkets. My Dad was landlord of the Woodman from 1957 – 1961 (roughly ) his name was Dougie Wise .Anybody remember him?.